It does not matter if you own a large home or small apartment with a balcony, outdoor furniture will help you to connect with the natural surrounding. 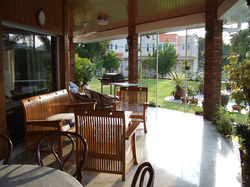 Whenever possible, one should plan to have furniture for patio or lawn. Shunde in China has a plethora of suppliers manufacturing furnitures for patio, gardens, gazebo or even a small balcony. 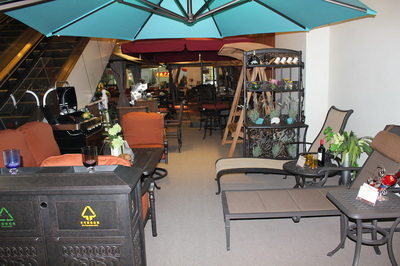 Finding them is easy, more difficult task is to select the right furniture from a factory producing high quality goods. Before buying please consider following questions? What material is used in making it? Will it suit my overall decor? Can it be suitably stowed away when not in use? How big is my place? 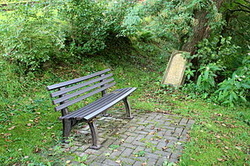 Wrought Iron has been used for outdoor furniture for centuries. 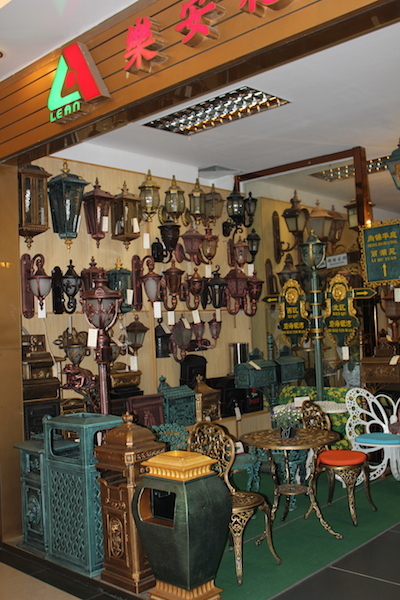 It was popular in 19th and early 20th century and now found its admirers in contemporary times too. It is heavy, durable and gives a classic old fashioned feel to your outdoor space. This may require comfortable cushions and an occasional repaint after a couple of years. It can be easily be washed with soap and water, thus can be maintained with minimum fuss. In China you can buy cheap it cheap mass produced version or go to some factory that will hand make for a fraction of western prices. Solid wood can compliment any outdoor. 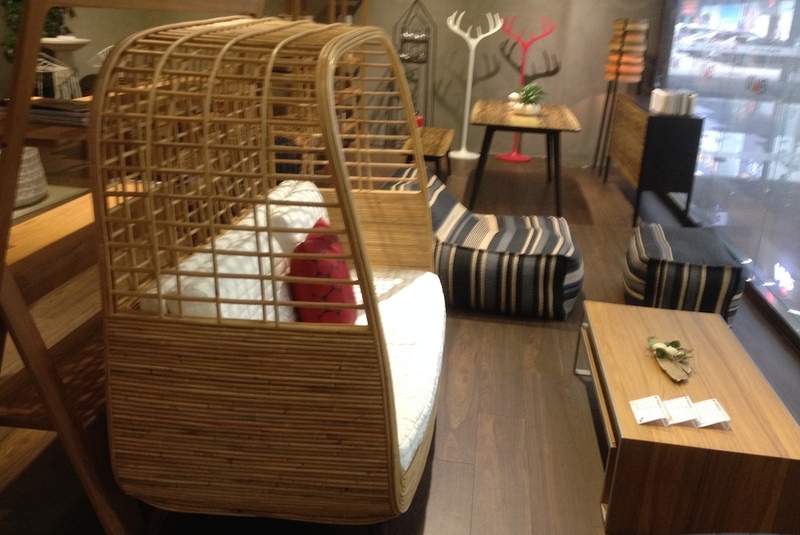 Although expensive, it is preferred by many home owners and designers alike because it imparts relaxed, casual look. 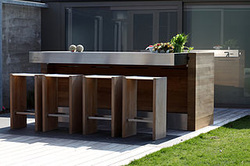 Most of outdoor furniture is available in a variety of woods such as pine, cedar or teak. As a rule dense wood like teak can last for a life time, but prices will be expensive. Many shops would try to pass on Veneered topped MDF as solid wood. So inspect carefully as solid wood tends to be heavy, showing off its end grain with irregular knots & curls on the surface. 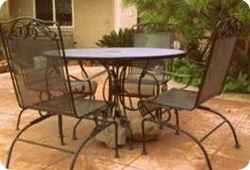 Plastic made outdoor furniture is inexpensive, lightweight and requires minimum care. Some plastic is made to look like wood that provides relaxed setting with a hint of wood while others are available in bright colors. 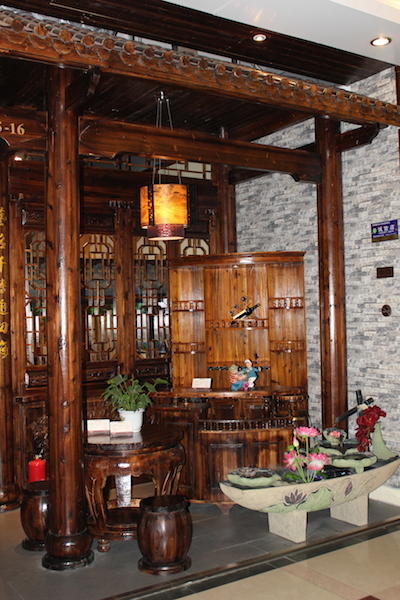 Poly resin furniture and decorative elements are sometimes fitted with lights. Plastic furniture tends to scratch easily and direct sunlight will fade its color so proper care should be taken. 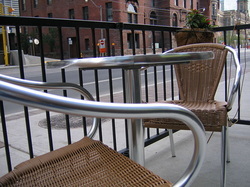 Steel is an excellent choice for an outdoor furniture. It is cheaper than aluminium. It is strong, low maintenance and attractive while it can be creatively used with glass. Down side is steel like all metal tends to get hot in summer and cold in winter. Aluminium is light weight but more expensive than other metal alternatives, namely steel and wrought iron. It also offers excellent resistance to corrosion and rust. 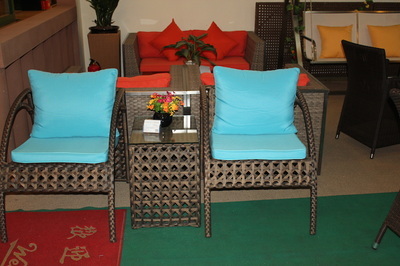 Aluminium furniture can be purchased in many attractive colors and finishes. 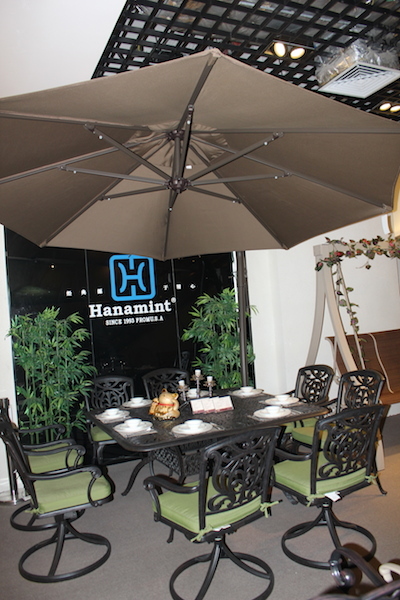 Dining sets: Outdoor dining is a great way to unwind and entertain guests. Most dinner set are available for 4 to 6 people. Some are available with canopy or sun umbrella. 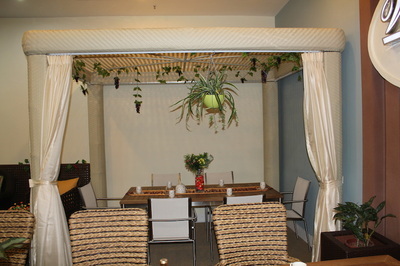 Bistro sets on the other hand is more suitable for a small balcony or an apartment deck. Recliners, hammocks and swing chairs are favorite alternate for filling nooks of a garden or lawn.